I stumbled upon this tiny novel in a list of books about books, which is a link I will always, always click on, despite seeing many repeats (most of which I loved, of course). I was pleasantly surprised to find a new one on this list - and I apologize now that I didn't save the list! But anyway, this book, newly translated from German, is an adorable, quick read. Valerie's aunt has disappeared, so she has been summoned to take care of her aunt's bookshop. Valerie thinks business background will help set the shop to rights & put her accounts in order. Yet, while working at the shop, she frequently finds herself lost in a good book. As she meets the shop's patrons and settles in to life as a reader, she tries to puzzle out what her aunt's plans were all along. This was another single-sitting read. More importantly, it is beautifully written & will call to the book lover in any reader. There's a tiny mystery tucked into the pages, a mysterious book that seems to appear at opportune moments in readers' lives. Valerie encounters it, and has to puzzle out its meaning as well. This novella is definitely recommended as a gift for other readers in your life. Verdict: Affirmed. A quaint and charming book celebrating the joys of reading. It's a lovely read for an afternoon when you're looking for a break. 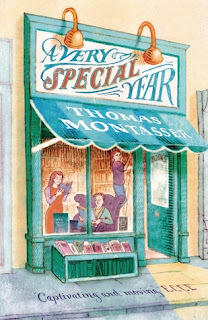 "A Very Special Year" by Thomas Montasser, translated by Jamie Bulloch, published August 9, 2016 by Oneworld Publications.